From their inception and through the early years of this century, long before automation, lighthouses were manned by keepers, often with their families in residence. In the case of the Petrie family, in 1922, their number included a new arrival, Martha. Over the years Martha, or Mattie as she was nicknamed, went with her parents to several lighthouse postings around the British Isles. Growing up in the unusual environment that constitutes a lighthouse station, where going out to play can be a major hazard, Mattie witnessed much of which most children could only dream. This book is her story - an account of the unique life of the lighthouse where the mundane activities of a mainland existence become exciting, certainly different and often downright near impossible. Growing up in the 20s and 30s, describing the war years and life in the Wrens, Martha Robertson brings to her story a delightful warmth and more than a touch of humour. This is a truly unusual account of an existence that has disappeared forever as automation puts the seal on lightkeeping as a thing of the past. A quiet life? Well that depends upon your point of view! 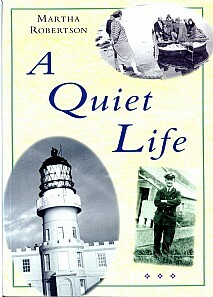 'A Quiet Life is written with warmth and humour and I strongly recommend it'. Fife and Kinross Extra.